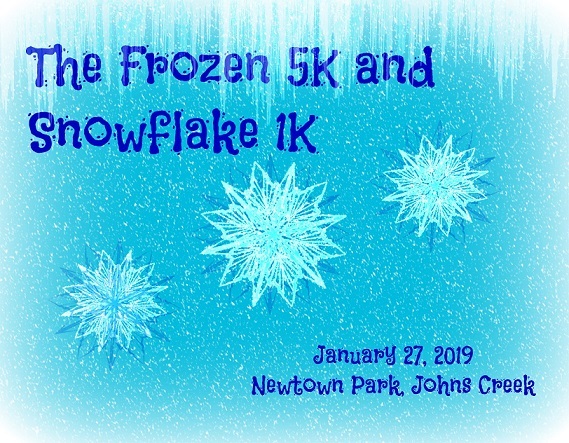 THE FROZEN 5K/1K IS COMPLETELY SOLD OUT! NO MORE REGISTRATIONS ARE AVAILABLE AT THIS TIME, AND THERE WON'T BE WALKUP REGISTRATION. THANK YOU TO EVERYONE THAT HELPED SELL THE RACE OUT FIVE YEARS IN A ROW! Both the 5K and 1K courses are on the paved bike trails, and are 100% closed to traffic. After the race, join the fun with lots of food, our DJ playing a mix of your favorite tunes, awesome photo opportunities, and much more! Plus there may be a very special guest to start the races!..... ALL finishers in the 5K AND the 1K get a cool shirt and snowflake finisher medal! Dress as your favorite fairy tale character for a chance to win some amazing prizes! Share your love of running with YOUR little snowflake and enjoy an event the entire family can enjoy! THERE IS A STRICT 250 PERSON LIMIT FOR THE 5K! The 5K is an AJC Peachtree Road Race Official Qualifying Event! ALL parking is at Newtown Park. Please use the Old Alabama Rd entrance and park in the first lot on the right.